First of all, thanks to Tom for hosting a great game at Borderlands yesterday, March or Die! My Arab horsemen did not quit have the oomph to slaughter the Legionaries fast enough. Thanks, Tom! Here is another of my IHMN companies, painted specifically for my wife and just finished last week. She is tired of me giving her companies that are not armed with rifles! Canada is a vast, rugged country, requiring brave and resourceful men to defend her. While the men of U Troop, NWMP are generally Canada’s spearhead in the twilight war against emerging threats, they cannot be everywhere. So when, trouble calls… The men of Scarlet Patrol answer! With years of experience protecting the people of Canada against dastardly villains in the cold vast wilderness, they are now frequently sent overseas to strike fear into the hearts of evil doers who would harm Canada and the British Empire. The constables of the NWMP need no introduction and are steadfast and loyal to a man. Fur trappers frequently accompany the Scarlet Patrol as well, scouting ahead, ferreting out ambushes, and providing colorful tales of life on the Canadian frontier. 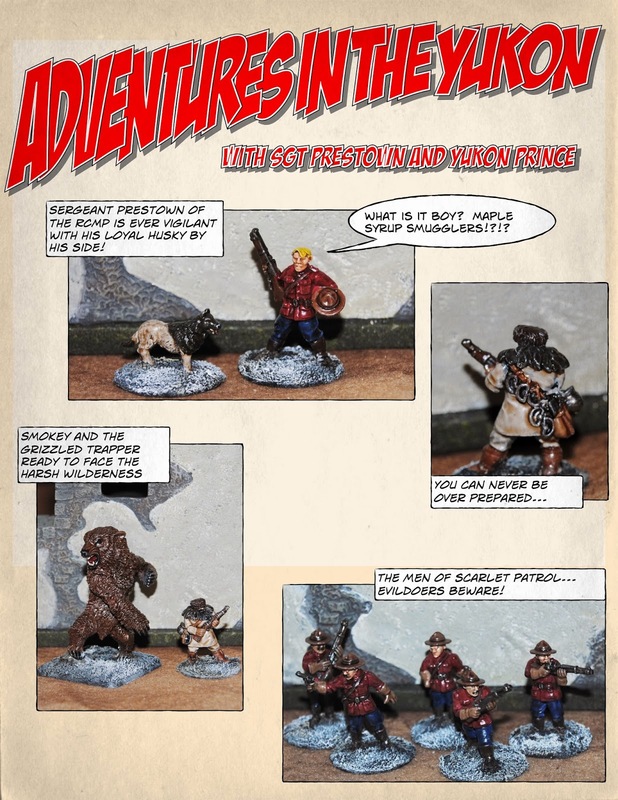 Trappers: PYP 06 (The Mad Trappers of Rat River) although other packs would do as well. I actually use a bear I found at my local game store, but this pack has a standing cave bear and 2 sabre tooth cats. Who doesn't need some extra sabre tooth cats? May upgrade one Trapper to Grizzled Old Timer (identical to Erudite Wit, +5 points), as he tells tall tales in a unique frontier way.